Help Mister Square save Shape Land by returning the super spinning power artifacts. Avoid touching all enemies. Ludum Dare 35 was my tenth time participating in the full Ludum Dare 48 hour game development competition. The theme this time was “shapeshift”. I knew fairly early that I wanted to make a game with controllable shape characters. My original idea was to have three shapes that you could switch between, and each shape would have a unique ability or power. I had envisioned having three playable shapes, which were the square, triangle, and circle. The gameplay was going to be similar to Trine, where the player would need to switch between the three to solve puzzles. I wanted to take a break from Unity and create a game in some other engine this time. I had heard a lot about Godot, so I planned to use that engine for this competition. Godot is a free and open source game engine that is very similar to Unity. Before the weekend, I worked through some Godot tutorials, so I was able to move a simple sprite around on the screen. In Godot, instead of GameObjects, it has Nodes which have similar properties such as position, rotation, and scale. Godot can be used to make either 2D or 3D games. It has a scripting language that is very similar to Python, where tabs and spaces are significant. Unfortunately, I wasn’t ever able to fully understand the physics system. In Unity, physics is fairly simple. You attach a RigidBody component and one (or more) colliders to your GameObject, and then you are good to go. In Godot, there are three types of physics objects (KinematicBody, RigidBody, and StaticBody). Your object has to have a CollisionShape or CollisionPolygon as well, and everything has to be parented correctly under your main object. It was very confusing, especially with the bounding boxes, and it just never did work correctly for me. After about four hours into development, I knew I wasn’t going to have the time to successfully make a game in Godot. Therefore, I fell to my backup plan which was to make a GameMaker game. I had heard a lot of bad things about how GameMaker handles things like collisions. Although, I have been impressed with some games that I’ve played recently, such as Crashlands, which was created in GameMaker. Fortunately, most of my initial development was creating the vector graphics for the game characters, so switching to GameMaker didn’t sacrifice too much work. I had worked through some GameMaker tutorials before, but this was my first time creating a full original GameMaker game. 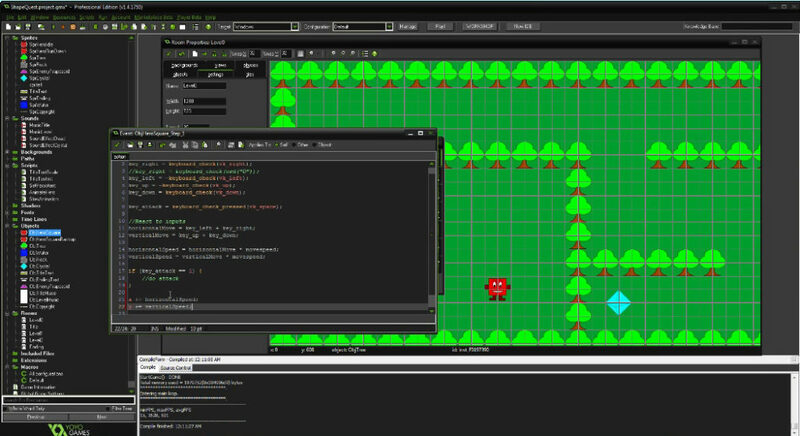 The GameMaker development environment is very similar to Stencyl, which I used to create Dream World for Ludum Dare 30. 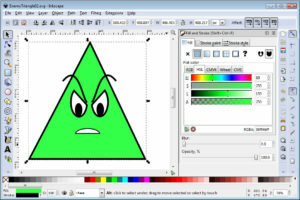 All of the graphics were created with Inkscape. I made a simple tree, which was composed of the union of three circles for the leaves, and a simple path for the trunk. I created other obstacles such as rocks (rounded gray rectangles) and water (curved blue bezier lines) I created a red square, green circle, and blue triangle characters, which all had two frames of walk animation. I had originally envisioned the heroes to use an additive color model, while the enemies used a subtractive color model (magenta, yellow, and cyan). I abandoned that idea, since a yellow circle looked much better like an emoji. I created a purplish trapezoid as the first enemy. I also had the idea of making the heroes parallelograms with sides of equal length, while the enemies would have sides of unequal length. When I first started designing the movement of the playable character, I used the default GameMaker actions. The problem with this method, is that the character is stopped whenever one of the movement keys is released. So the player could be holding two movement keys (such as up and right arrows), but the player would completely stop whenever either of those keys are released. For instance, the character would expect to keep walking right if the up key was released. Also, with the default GameMaker movements, the chacter would move when the key was initial pressed, and would pause for a moment before it would continue moving. This is similar to typing into a text document, when a key is held down. First it adds the character, then pauses, then repeatedly adds the character multiple times. To resolve this, I found a tutorial on making a platformer in GameMaker, so I just modified that method to work with a game in overhead view with no jumping. This method keeps track of a horizontal a vertical movement speed, and the speed values are modified based on which keys are held down. Now, the movement controls felt much more accurate and responsive. Now that I had everything necessary to create a level, there needed to be a goal. I made a simple cyan diamond as a crystal. To differentiate it from the other world objects, I made it spin and flash between cyan and white. Adding custom scripts to GameMaker objects is fairly simple, and the GameMaker API is well documented. The first enemy that I created was the purple trapezoid. It simply just moves vertically on the screen until it collides with an object, then it reverses direction. When the player collides with an enemy, the player is returned to the starting position. If I had more time, I could have added a health meter so the player wouldn’t have to restart after being hit just once. I gave the enemies angry faces with two frames of animation, which reminded me of the boxer profiles in Mike Tyson’s Punch-Out!!. The second enemy that I created was the yellow circle, which was modified from my previous green circle hero. I just had to remove the arms and legs. The yellow circle just moves in a random direction for two seconds and then changes to a random direction and moves for another two seconds. This behavior is very easy to create in GameMaker, and I had remembered implementing the behavior in the “Catch the Clown” tutorial that comes bundled with GameMaker. 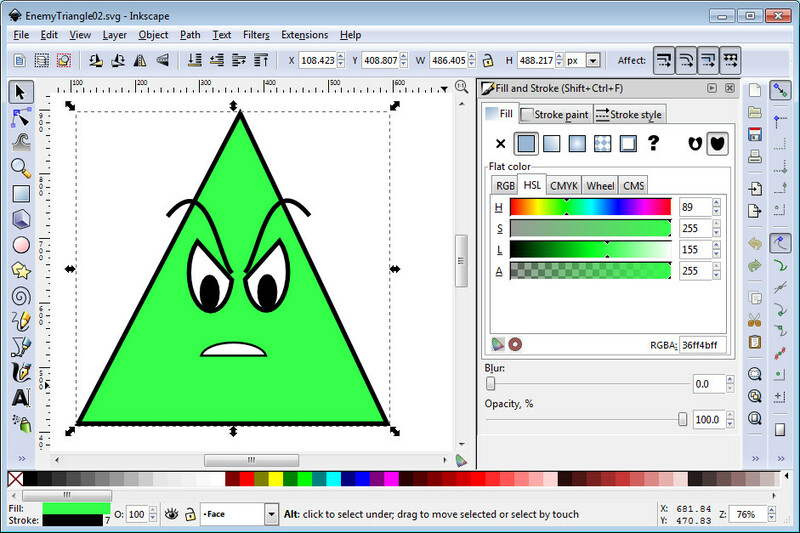 The third character I created was the green triangle. I wanted this to be a water dwelling enemy that shoots projectiles at the player. This behavior is similar to the Zora in the original Legend of Zelda. If the player stands in one position for too long, then they will be shot, so the player has to keep moving to stay out of the line of fire. 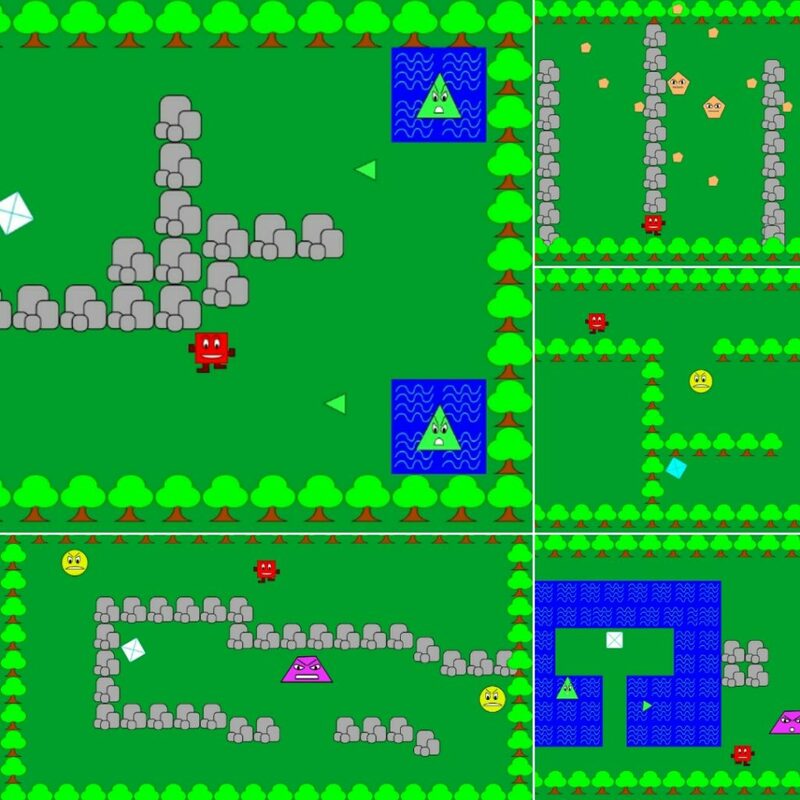 The third level becomes more difficult with four green triangles shooting at the player at once. The final enemy that I created was the orange pentagon. Originally, I had made the pentagon cyan, but I thought that would be too confusing with the cyan crystal goal, so I changed the color. The orange pentagon shoots in four directions at once and randomly changes location after every shot. These characters are similar to the Wizzrobes in the original Legend of Zelda, except they shoot in four directions. Their projectiles can be easily avoided, as long as the player doesn’t stand directly horizontal or vertical from one of the orange pentagons. For the music, I used GarageBand again on my MacBook Pro. A few weeks ago, I had read an article on Gamasutra about music theory, and to watch the number of steps and skips, so hopefully my music sounds a little better for this game. I usually try different instruments until I find something that sounds good. I use the command + left mouse button to add new notes to the piano roll. I’ve found that it is much easier to modify the lengths and positions of the notes in Piano Roll editor than the Score editor. I used the C major key, so I just made sure I just stuck with all of the “white keys”. Overall, I think it took about an hour to create the music. Like I’ve done with my previous games, the title screen music is just the game music slowed down with some of the instruments modified or dropped. I used BFXR for creating the sound effects when the player is hit or when the crystal is collected. I used Audacity for touchup work. I also recorded my voice again for the title screen and game complete screen. I used Audacity to add a bit of an echo sound. Unfortunately, my voice sounded a little faint against the background music, and I never found a way in GameMaker to make it louder. There are many ways the game can be improved. First, I would like to give the player a method for attacking the enemies. I would also like to have a way to move from room to room, instead of collecting crystals. I would also like to have various items, money for purchasing new equipment, and many more enemies. Finally, I played the game MANY times to ensure that all five levels were completable and also not too easy to finish. I made both Windows desktop (EXE) and HTML5 (web) builds, and uploaded to Itch.io and GameJolt. I think the Windows build is the better experience, but I know some people only prefer playing the web version. It just seems like there is more lag and dropped frames in the web version. Overall, I was happy with the simple game that I was able to make in GameMaker. I really appreciate everyone who has played it already. It already has over 60 votes, which is by far the most votes of any of my Ludum Dare games have received.